The Supreme Court is more concerned with the politics of the health care debate than the law. Forget precedent. Ignore Scalia’s musings. Next week’s health care argument before the Supreme Court is all about optics, politics, and public opinion. Read all of Slate’s coverage about the Affordable Care Act. Next week the Supreme Court will hear arguments over the Affordable Care Act, what many people know as Obamacare. The mainstream opinion is that this is unquestionably the most important case of this term. That opinion is no doubt supported by the attention it will receive—six hours of argument over three days. But amid all the throat-clearing, odds-making, and curtain-raising that surrounds next week’s health care case, it seems worth noting what is in dispute and what’s not. So let’s start by setting forth two uncontroversial propositions. The first proposition is that the health care law is constitutional. The second is that the court could strike it down anyway. Linda Greenhouse makes the first point more eloquently than I can. That the law is constitutional is best illustrated by the fact that—until recently—the Obama administration expended almost no energy defending it. Back when the bill passed Nancy Pelosi famously reacted to questions about its constitutionality with the words, “Are you serious?” And the fact that the Obama administration rushed the case to the Supreme Court in an election year is all the evidence you need to understand that they remain confident in their prospects. The law is a completely valid exercise of Congress’ Commerce Clause power, and all the conservative longing for the good old days of the pre-New Deal courts won’t put us back in those days as if by magic. Nor does it amount to much of an argument. So that brings us to the really interesting question: Will the Court’s five conservatives strike it down regardless? That’s what we’re really talking about next week and that has almost nothing to do with law and everything to do with optics, politics, and public opinion. That means that Justice Antonin Scalia’s opinion in the Raich medicinal marijuana case, and Chief Justice John Roberts’ and Anthony Kennedy’s opinions in Comstock only get us so far. Despite the fact that reading the entrails of those opinions suggest that they’d contribute to an easy fifth, sixth, and seventh vote to uphold the individual mandate as a legitimate exercise of Congressional power, the real question isn’t whether those Justices will be bound by 70 years of precedent or their own prior writings on federal power. The only question is whether they will ignore it all to deprive the Obama of one of his signature accomplishments. Professor Randy Barnett, the intellectual power behind the entire health care challenge, wrote recently that Justice Scalia could break from his previous opinions—freeing him to strike down the Affordable Care Act—“without breaking a sweat.” I suspect that’s right. Oddly enough that turns more on what we think about the case than what they think. The court likes to pretend it’s completely above public opinion, inured to the momentary zigs and zags of the polls. But most of us know that nothing could be further from the truth. We know that the court took a huge public opinion hit after Bush v. Gore and again after Citizens United. But that doesn’t necessarily help the administration. Because in this case the American public believes the health care law is unconstitutional. The most recent polling I have seen shows that over 50 percent of the American people—including many who benefit from popular provisions of the law—still believe it’s unconstitutional. Part of this goes back to the administration’s abject failure in defending the constitutionality of the law over the past two years. Of course the public thinks the law is unconstitutional. They never heard a single word defending it. And I am willing to lay odds that if the public broadly supported ACA, we would not be having a six-hour conversation next week suggesting that the court would strike it down. The challengers’ greatest weapon in this case was momentum: A series of lower courts, and then an appeals court, signed off on the argument that this was a fundamental incursion into basic liberty. Then, suddenly, the case seemed plausible. On the other hand, I’d suggest that there is an equally powerful countervailing force at work on the justices. Because, as it happens, the current court is almost fanatically worried about its legitimacy and declining public confidence in the institution. 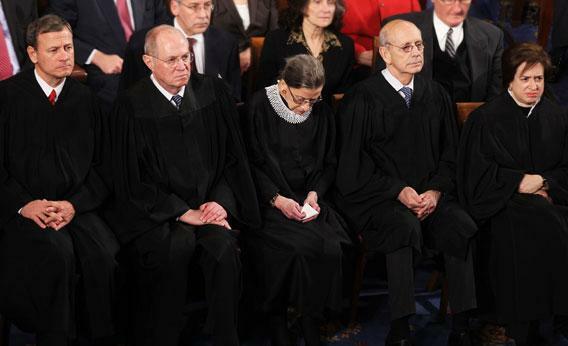 For over a decade now, the justices have been united in signaling that they are moderate, temperate, and minimalist in their duties. From Chief Justice Robert’s description of himself as just an “umpire” and his speeches about humility and the need for unanimity, to Stephen Breyer’s latest book Making Our Democracy Work—a meditation on all the ways the courts depend on public confidence. Roberts even nodded at that court-wide anxiety by devoting most of his 2011 State of the Judiciary report to issues of recusal and judicial integrity, and by reversing his own policy on same-day audio release, in order to allow the American public to listen in on the health care cases next week (albeit on a two-hour delay). That means that the court goes into this case knowing that the public is desperately interested in the case, desperately divided about the odds, and deeply worried about the neutrality of the court. (Greenhouse points to a Bloomberg News national poll showing that 75 percent of Americans expect the decision to be influenced by the justices’ personal politics.) To hand down a 5-4, ideologically divided opinion just before the Republican and Democratic Party conventions, would—simply put—prove that 75 percent correct, and erode further the public esteem for the court. Justice Clarence Thomas doesn’t worry much about things like that. I suspect Chief Justice Roberts and Justice Kennedy worry quite a lot. If I am right about this, some justices may believe that this isn’t a fight worth having. Not now and not over this issue. Recall, even absent the health care case, the 2011 and 2012 terms will represent two of the most divisive and incendiary terms in recent memory. The court isn’t just hearing the health care case this year. It also heard a Texas redistricting case, and the Arizona immigration case. Next year it will hear the Texas affirmative action case, and very likely a case that will question the entire existence of Section 5 of the Voting Rights Act. Oh, and next term, the court may well have to contend with a gay marriage case, and at the rate state legislators are passing patently unconstitutional abortion regulations, it’s not unlikely the court will be revisiting Roe soon thereafter. Given that line up of future cases, the five conservatives may want to keep their powder dry for now. I think they will. Poll released this week by the American Bar Association agrees, saying that most courtwatchers (85 percent) believe Obamacare will survive. And why is that? Not just the fact that—as I’ve said at the outset—the law is constitutional, well within the boundaries of Congress’ Commerce Clause authority. It’s because for the court to strike it down, the justices would have to pick a fight that wasn’t theirs in the first place. The challenges to Obama’s health care initiative didn’t begin in the conservative legal academy. They didn’t even really blossom in the conservative legal media or think tanks. The real energy of these challenges arose out of those Tea Party town halls throughout the summer of 2010, in response to a longing to return to constitutional values, states’ rights, and ideas of individual liberty that have been dead for almost a century. That isn’t to dismiss the validity of the passionate public opposition to this law, or even to denigrate the truly heroic efforts of Randy Barnett, the Cato Institute, or the millions of Americans who deeply believe that this is a case about liberty, broccoli, and the short hop from the individual mandate to federal tyranny. It’s simply to say that it’s no accident that these cases were filed by state attorneys general and governors swept up in political currents, willing to make novel arguments in the form of what was always a constitutional Hail Mary pass. It’s no accident that until the lower district courts started striking down the act, none of the challengers really believed that they could succeed. And it’s no accident that three of the most influential and well respected conservative jurists in the land have ruled that of course the law is constitutional, even if they hate it as a policy matter. It’s no accident, either, that Charles Fried, Reagan’s Solicitor General and Harvard conservative legend, said in an interview with Dan Rather Reports this week the case would be decided 8-1—in favor of the law. The conservative legal elites don’t believe in the merits of this challenge, even if the public does. Next week’s health care cases rocketed up from the district courts to the Supreme Court in less than two years, such that we are all still feeling the whiplash. Even so, they may in the end be too late. The political momentum that lit the visceral public fire under these challenges has already begun to falter. The Tea Party has plummeted in the polls. Ideas about getting back to the “Framers’ constitution” seem to have stalled with Michele Bachmann’s confusion of what the Framers really believed. The economic crisis has largely displaced the constitutional crisis that marked the 2010 election cycle. And the American public has started to see the tangible benefits of the law; a gradual process of understanding that this is less about mandating what we eat or buy and more about the (deeply conservative) notion that nobody should benefit from a system into which they are not willing to pay. That’s why the current fuss being made over the health care cases has offered the court a perfect cover story. They will hear six hours of argument next week. They will pretend it is a fair fight with equally compelling arguments on each side. They will even reach out and debate the merits of the Medicaid expansion, although not a single court saw fit to question it. And then the justices will vote 6-3 or 7-2 to uphold the mandate, with the chief justice joining the majority so he can write a careful opinion that cabins the authority of the Congress to do anything more than regulate the health-insurance market. No mandatory gym memberships or forced broccoli consumption. And then—having been hailed as the John Marshall of the 21st century—he will proceed to oversee two years during which the remainder of the Warren Court revolution will be sent through the wood chipper. Looked at on the merits, the Affordable Care Act isn’t the “case of the century.” It probably isn’t even the “Case of 2012.” Next week we will all be glued to the political spectacle. But stay tuned. The real action in Roberts’ court has yet to come.